As you all know by now, we love doing Escape Rooms. 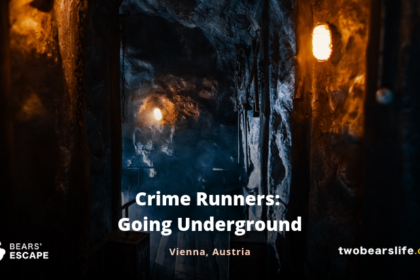 So we were curious about this new trend starting last year where the board game industry also wanted to be part of the Escape Game business. Various companies released their take on the “Escape Room Home Kit”, where they tried to capture the spirit of Escape Games by bringing it home to your living room. 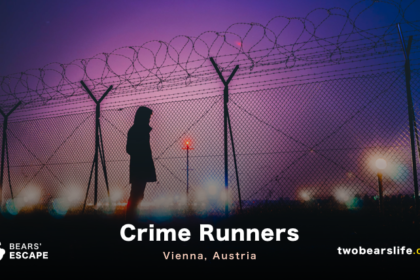 Since we are also not living in an area with a vast amount of escape rooms in our reach, we fit the target audience well. We love Escape Rooms but do not have to chance to just go to a new room whenever we feel like it. So a board game is a good chance to calm our escape room need. 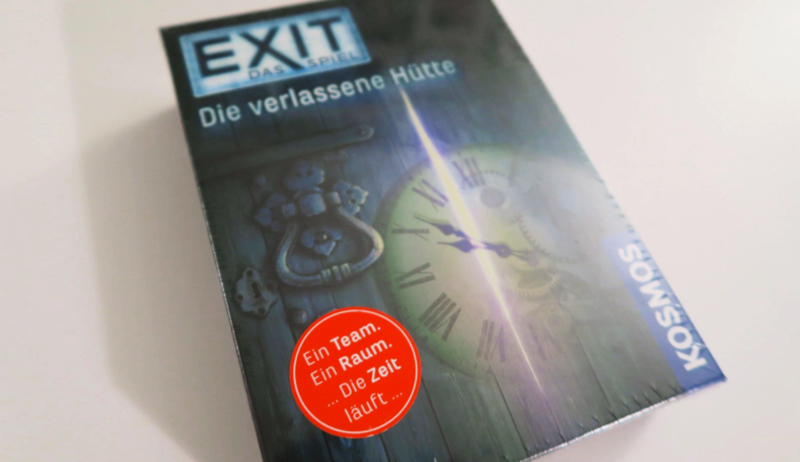 The first game we will review is “Exit – Die verlassene Hütte“. Since the game is only available in german (for now), we will review the german version. After a car crash, you and your friends look for shelter for the night. Luckily, you find an abandoned cabin in the woods. But when you wake up in the morning, barred windows and the locked door keep you trapped inside the cabin. All you find is a strange book … will you escape in time? The box contains 1 decoder-plate, 86 game cards, 3 so-called “strange things”, 1 book and a folder with game instructions. After unpacking the game, we read though the instructions. This is vital for this game, as it tells you exactly which elements you need for the start of the game and what to do with the rest. Personally, I am always the guy who likes to start a game right away and than go through the specific rules afterwords. That is not a good approach here, but the rules are also compact, so going though them before starting was not really a big deal. All you need, besides the elements that come with the game itself, is some paper & pens for every player and a pair of scissors. The latter is not really a must, but believe me, you will be glad to have one on the table later on. We actually played the game in a team of three – all of us pretty familiar with doing classic Escape Rooms and all of us speaking german. The whole game is, as of now, only available in german. 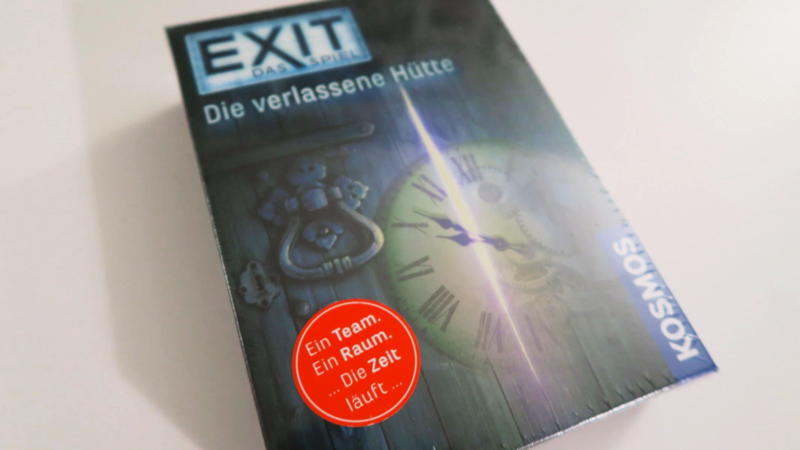 It is possible to translate certain elements for non-german speakers, but since most of the puzzles are also directly connected to some kind of text, the enjoyment of the game itself would not be the same. 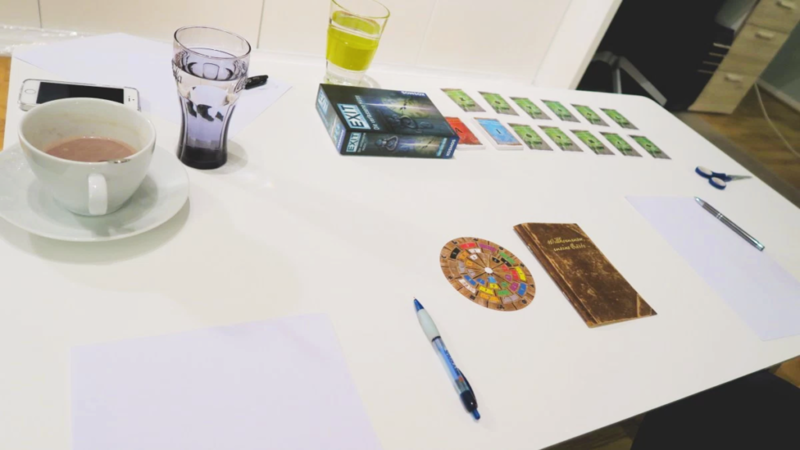 After having only a limited amount of items on the table when the game actually starts, we were all really surprised how well we got into a rhythm. It didn’t take us long to solve the first puzzle and it was a really cool experience from that point on. How does the game actually structure its puzzles? Without giving away any details, here is how they do it: Each puzzle you have to solve is connected to a certain symbol. Why is that important? This symbol gives you a connection from the game map to the decoder-plate as well as to the clue-cards. 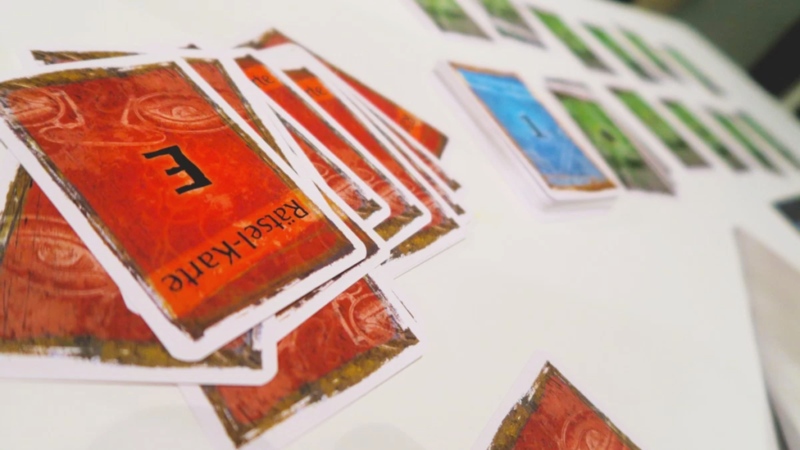 The game provides three clue-cards for each symbol, meaning the game will give you certain clues up to the solution (meaning, you can not get stuck in the game). Once you think you have the answer to a certain puzzle, you will have to put the solution into the decoder-plate. This will give you a number, which will than direct you to a solution card. Another step follows which will verify if you really have the right solution. Sounds complicated while reading it, but it works perfectly fine while playing – trust me. To all of our surprise, the solution-validation process in the game works absolutely flawless. We did come up with some wrong answers, but the game always told us when we had to continue to look for the right one. The setup for this is actually pretty simple and really well thought through. We finished and escaped the abandoned cabin after 60 minutes and 15 seconds. Granted, we did not rush through the game because we wanted to enjoy it and capture some moments for this review. And we had a pretty good time doing it. Can it hold its own compared to a real escape room? The comparison would not be fair, on the other had, we did play some real escape rooms where we did not have that much fun. 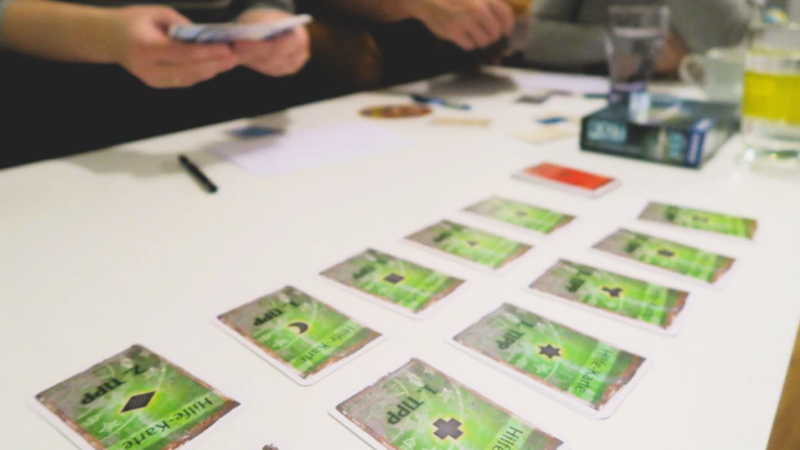 Although the package claims the game works for up to six people, we think you should not be more than four, as long as everybody really wants to be involved. Most of the puzzles are connected to paper elements and this limits the actual “task per person” to items per puzzle. Which means if you are up to four people, everybody will have a good chance to pitch in. In case you are more, somebody could feel left out. One negative point we have to address about this game is the lack of replay-ability. 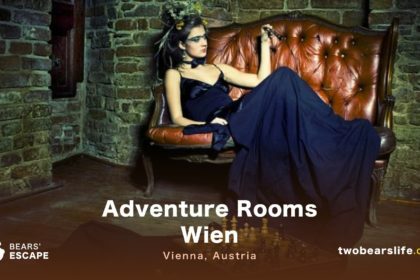 And no – before you judge us for saying that – I am totally aware that most escape rooms also are a one time experience. That is not the issue. The game packaging even warns you that you will only be able to play this game one time. So what do we mean? The thing is – you actually destroy some game elements while playing this game. Once you are done, you can throw the game away. There is no way to give this game to someone else because some parts are simply destroyed. Sure, the game is only around 10 euros and I am pretty sure KOSMOS would like to sell new items instead of opening up a reseller-market. On the other hand, you throw away like 80 % of reusable stuff, so that is not a perfect solution. KOSMOS, how about a “send us the rest back” option to reduce the amount of trash? Anyway – that is just a really small point.